Making a hair pin straight can take lot of time, but it is important to follow a proper procedure to do this process. Try to keep all the styling tools that are used to make the hair straight by consulting a hairstylist to avoid any problem during the styling process. To get this hairstyle, first wash the hair as usual with a shampoo and condition it by using the products that are specially make for straightening hair. Try to get rid of the moisture from your hair by using a towel before using a hair dryer to reduce the frizz. 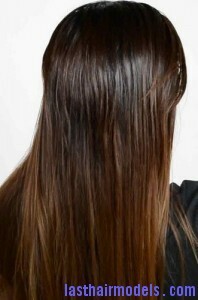 Apply a serum all over the hair protect it from heat damage and use a nickel-sized on hair length as well as thickness. Next brush the hair from top to bottom to distribute the application evenly all over the hair. Start blow drying the hair by running your fingers in different directions and attach straightening nozzle to the dryer to dry the hair. Secure the top sections of your hair away from the styling process and wrap one section from the root around a round brush. Keep the dryer at a 90-degree angle and follow the hair brush in a straight direction by combing the hair till the end. Continue this process until the section is dry before moving to the next section. 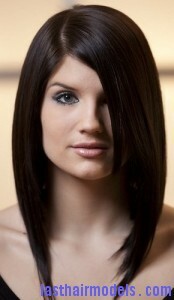 Now use a straightening iron all over the hair with ceramic plates slowly and smoothly with a slight tension.